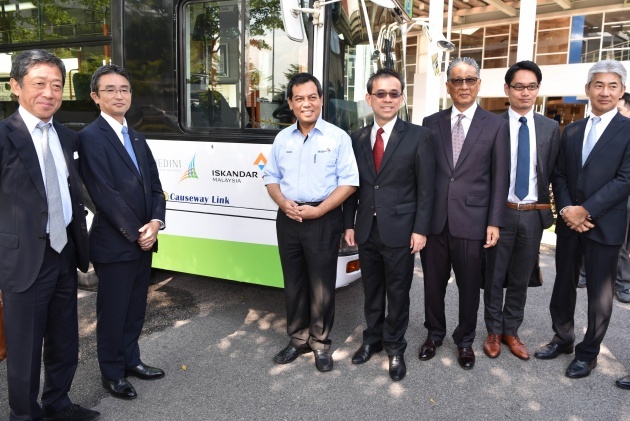 Following the signing of a Memorandum of Understanding (MOU) between Mitsui, Medini Iskandar Malaysia (MIM), Hino Motors Sales Malaysia and Handal Indah, Medini City will soon welcome the first hybrid bus in Malaysia. The move comes after Mitsui and MIM invited Hino to conduct a trial run of the hybrid bus, which will go on for five months beginning from July 2017. In total, the bus will ply six routes, including the Iskandar Puteri route that allows commuters to travel from Puteri Harbour Ferry Terminal to Larkin Sentral via Medini. The introduction of the hybrid bus could lead to a more economical and clean public transport system, in line with Iskandar Malaysia’s Low Carbon Society Blueprint, where it aims to reduce carbon intensity in Iskandar Malaysia by 58% by 2025. The Hino Hybrid Bus features a Euro 3 diesel engine and new hybrid vehicle system, which is said to offer better fuel savings and reduced CO2 emission compared to a conventional diesel-powered city bus. The bus, which has a capacity for up to 75 passengers, will also come with air suspension and a low-floor designed chassis for comfort and convenience. “A big part of Iskandar Malaysia’s journey towards becoming a Strong and Sustainable Metropolis of International Standing focuses on green environment and smart city living. We embrace ideas and initiatives that contribute towards these two agendas. As such, the possibility of having hybrid busses transporting people across the region is something very exciting and inspiring,” Datuk Ismail Ibrahim, chief executive at the Iskandar Regional Development Authority, said. “Unique aspects of commercial vehicles include their comparatively large size and loading capacity, the long distances they travel, and their wide array of uses and places where they are used. Taking into account these varying conditions, Hino Motors considers type of environmental technologies that would be suitable. By providing users with optimally equipped vehicles, we believe HINO Hybrid Bus has the advantage in providing vehicle with improved fuel-efficiency and zero carbon,” said Ken Iwamoto, managing director of Hino Motors Sales Malaysia. Japan smart, clean & inspiring. Medini is not a city. No one lives there but miserable property speculators. Better late than never. Japan have been using this since 2005. Prasarana should use this as well. Prasarana alredi using EV buses since 2015. Hybrid bus ada but where is our Hybrid Proton? Proton promised us 8 yrs ago. Until today, no news. Both Perodua and Proton got no news of Hybrid or EV/PHEC when all over the world, car companies are moving towards EV. Time for Proton and Perodua to learn from Hino. Cukup lah tidur. RM1.1 Billion not spent on Hybrid or EV/PHEV ? 1.1B is probably for cumulative R&D efforts so far. Euro 3? people already use at least Euro 4 lah. Come on. We believe HINO Hybrid Bus has the advantage in providing vehicle with improved fuel-efficiency & zero carbon,” said Ken Iwamoto. Wow, ZERO carbon. That is GOOD for Mother earth. The Future of Hybrid Bus has arrived. Hopefully it will succeed & spread allover Malaysia. TQVM Hino & Medini City. Hybrid !! Go full EV .. city in whole world is using byd ebus .. stop using Japanese half baked hybrids .. diesel some more..